Tell us the story of your home. To you, what sets it apart or makes it unique aside from the fact that you and your family are the ones who live in it. For years, my husband would always try to figure out what my “love language” was: physical touch? Gift giving? Words of affirmation? None of the usual really fit. But one day it dawned on me that creating a warm, beautiful home was how I showed my love. I delight in seeing the young children notice what has changed, and comment on what I put together. It’s how I express what is important to me in real and concrete ways. For instance, the kids’ rooms are small, cozy, and uncluttered. They are just for sleeping, not playing. That’s intentional because I want them to, (firstly, get good sleep), but secondly, to play together! I want to show that them that their “play” is very important to me, and that they deserve the whole house as their creative play space.”I also want to use our home to instill a sense of wonder in my children. I want them to see art that incites their imagination, furniture of unique textures and shapes, and natural materials like marble and teak root. I like to tell them (mostly true) tales of how our furniture: “Guess what? 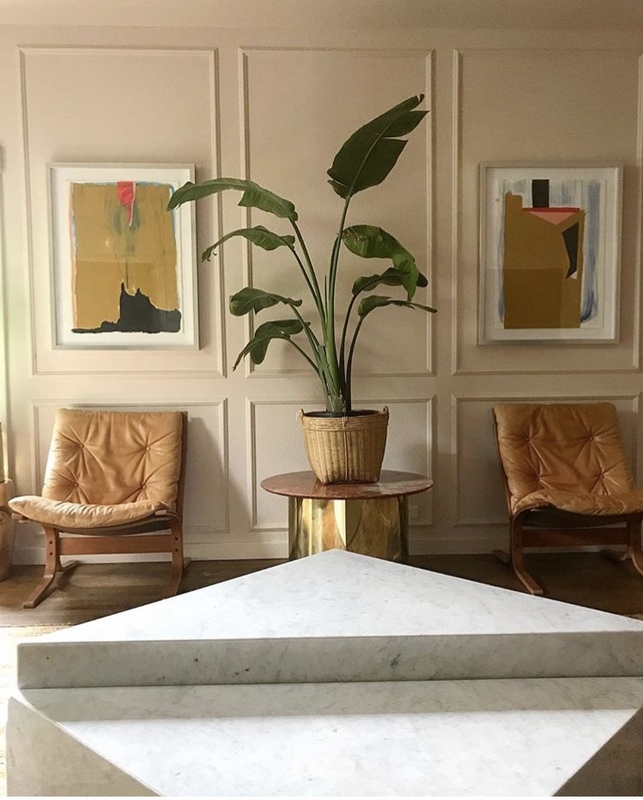 Our marble table was cut from a real mountain, in a place called Italy--the same place where Michelangelo got marble for the famous statue of David! Can you believe it? And that the rug was woven by a woman who made thousands of knots with her two expertly trained, God-given hands!” And they say “wooooow!” My husband doesn’t choose to have much say in the process, though he also loves our home, so it’s definitely my gift to my family. 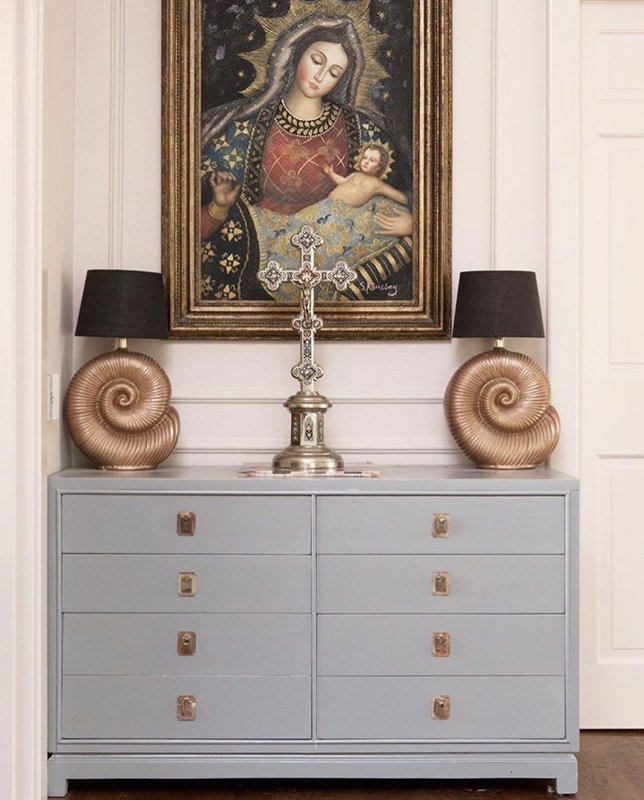 I love sculptural furniture, warm colors, and an abundance of art—plus just the right touch of weird in every room. I can’t seem to articulate a label for that! Right now, my favorite space is my dining room. It’s dark, moody, and saturated, but I get a fabulous view of all the art in the living room and paintings in the hallway from there too. In the dining room, I can sit as a silent spectator to the best views in the house. What a great question! I spend pretty close to nothing on all the furniture in the house. Honestly! 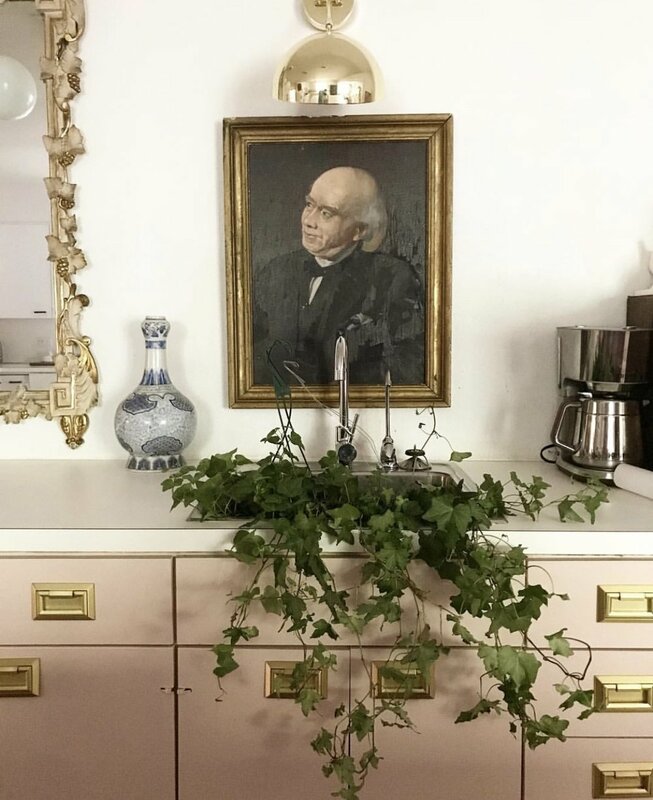 Partly because it’s all thrifted vintage, and partly because I re-sell other furniture I find at a profit, to make up for the cost of what furniture I do purchase. But I spend every extra dollar I have on art! In fact, there is just one art piece in my living room that cost more money than every piece of furniture in that room combined. That’s intentional too—art means so much to me. I love rugs, furniture, etc… but art is that one thing I can buy that brings me lasting joy. It’s like having a piece of human person’s soul in your home—and the only thing I love more than things, are people. I am the oldest of seven kids, so life back then was a lot like my life is now: insane! Most of our lives we lived in a small 1800s house that was converted into a duplex and we lived on the bottom half. We didn’t have much at all, but it was a happy home. My mother has a different style than me, but she also changed the house around constantly—that must be where I inherited my chronic rearranging disease. We grew up buying everything in thrift stores and garage sales—before it was cool. My dad is a engineer/scientist now, but he graduated college when was around 10 years old, so he was a handyman as a second (or third) job when he was a student. So, when I was younger, our house was frequently under construction as he was always renovating things in our old house at my mother’s request, and with the reluctant help of the kids. I have vivid memories of my father tearing out carpet, and my chore was to pick out all the staples left in the floor. When I was 15 we moved to Arizona into a giant McMansion with beige everything. I HATED it! It wasn’t until then that I appreciated the beauty of an old home that runs on home-made creativity. I don’t claim to be a great DIY er. I’m more of a “I did this while 3 toddlers climbed on me and it looks great from far away and it was really fun! You should try it’ll you’ll do a much better job!” My favorite one I ever did was the barkcloth ceiling. I found a giant, vintage, handmade mudcloth and made it into a ceiling “wallpaper” and it was truly incredible! It was like having art on the ceiling. No actually! It’s a constant struggle to decipher whether I like something because I like it or because I like it in someone else’s house. Or, whether I like something just because it is trendy, or whether I hate something just because it’s trendy. I can honestly admit I have to consciously consider that, and I’ve made mistakes in decorating when I didn’t consider my own voice deeply enough. Scrolling Instagram can be a confusion for your inner voice just as much as it can be an inspiration. I sometimes get stuck in the miasma of design that sells, and not see the designs that speak to me. In truth, I can consider that a metaphor for my own life. Am I am who I am because someone said I was or because that’s who I am? How’s that for a deep thought of the day! The same thing happens when painting on canvas. I know certain paintings will sell because other people like them—but do I like them or do I like them just because I know others do? When I first started selling my paintings that was a difficult struggle. I have learned that painting is a necessity for me, not for others. I must embrace what I see and put it on the canvas and hope someone else sees it too. Your home is your canvas, that means your home is art. Some believe art is entirely subjective, but I don’t think that’s entirely true. I believe that the best art has truth, beauty, and goodness. So, when choosing something for your home, ask if it is true, beautiful, and good. But what does that mean? Practically speaking, you have to do that by filling your home with things---objects. And objects are just things that you make or buy—they don’t have souls. But, people have souls, and people are material beings, and as material beings, we find comfort in material objects that speak to our soul. See how that works? So, fill your home with material things that mimic your non-material soul. Things that have stood the test of time. Design that is not a trend of the day, but a lasting testament to your character. Things that express not only beauty, but also truth. Things that have served generations of masters. And things made by the hands of you or other soulful people with love and care. So, in sum: Vintage. Antique. Handmade. Collected. Then combine them all in a symphony that is uniquely yours. How does what you do currently in your 'professional' life tie into this idea that home is "more than just a place we live" but that it holds much more of a redemptive and restorative power than we may currently embrace culturally? Your home matters. Design matters. No, it doesn’t have to be a fancy home. But even Neanderthals painted their caves. Interior design is in our nature! When I think back to the lowest times in my life, I think about where I lived and what it looked like. Then, when I think back to the happiest parts of my life I think about what THAT looked like. There’s a clear difference! I can still remember the paintings on the wall of my childhood home, the pattern of the wallpaper in my bedroom, and the books that I read that sat in the bookshelves of my youth. 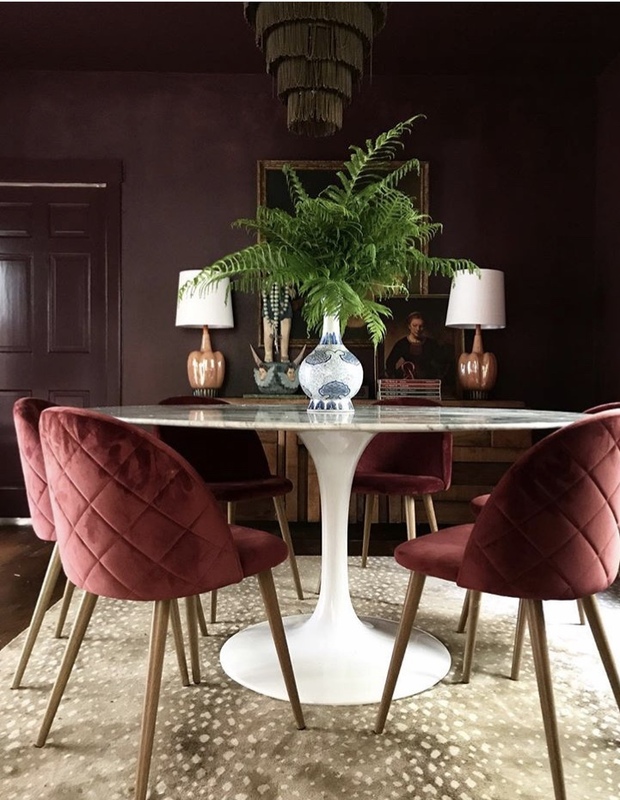 I can remember the exactly sounds of the creak in the floor of the first home my husband and I bought, and the colors of the nursery we made for our first-born baby. When I was in my toughest year of law school in a sleep-deprived, mentally tried and tested state—I can’t even remember basic details of what my apartment looked like! Perhaps having a space of our own is one of the greatest forms of self-care. 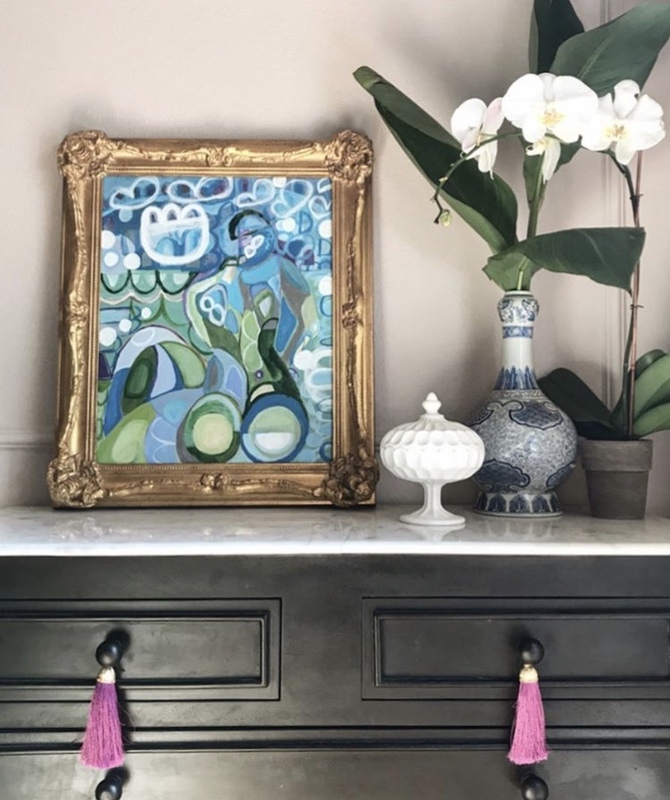 Katie Sarokhanian is a Dallas based painter and mother of four who paints figurative expressionist paintings with an eye toward interior design. She believes that art is essential for your home, and that style is essential to life. And, above all: truth, beauty, and goodness. We’d love for you to hop over to the Restoration House Instagram account and follow along with our weekly hashtag that complements this series. Tell us a bit more about your own home story by using #mywholehome there. Don’t forget to come by next week for more inspiration as more friends share their own #mywholehome stories. Sign up with your email address to receive a little bit of home and lifestyle inspiration delivered right to you inbox!